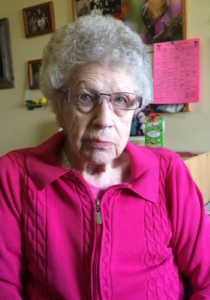 Mom passed away peacefully at Central Haven Special Care Home in Saskatoon. Central Haven was her special home for the past several years and we thank the staff for their excellent care and many acts of kindness. Marion was the second of 8 children born to Leroy and Ella Statler. She was born in Indian Head and except for a period during WWII when she worked at a factory in Ontario, she was a lifelong Saskatchewan resident. She married Forrest (Dutch) Thompson in July, 1946 and began a career as a hard working farm wife and Carlyle and district community member. Marion met all the challenges of farm life with determination and loved the supportive friendship of wonderful neighbors and community members. Dutch and Marion were avid community supporters and were always quick to volunteer and be involved. This was particularly true to support their children and grandchildren. They were Carlyle Cougar hockey fans and enjoyed many hours at the arena. They travelled many miles to attend the grand kid’s hockey and ball games and special events. Gramma enjoyed every trip and every opportunity to be with her family. She loved camping, being at the lake, a good joke and sharing meals with family and friends. Marion is survived by her sister Ida and three children – Judy, Carol (Malcolm) and Neil (Karen); 9 grandchildren – Aaron, Dawn, Tristan, Katie, Michael, Joey, Patrick, Tucker and Kaelen; and 5 great grand children – Kolten, Erin, Dannie, Griffin, Ben and Finley. Dutch and Marion moved to Coteau Place in Arcola in 2007. Dutch passed away in 2008 and Marion moved to Saskatoon in 2014. We enjoyed a wonderful celebration of Marion’s 100thbirthday this past August. We have many fond memories of our Mom and Gramma – she lived a long and loving life. In lieu of flowers, donations can be made to the Glen Morris Cemetery in Carlyle, SK. My heartfelt condolences on the loss of your mother. She was so very loved and well cared for in her final days. Take care. She did have a wonderful well lived life. She has always been close by and an important part of our lives whether on the farm, around town, at the rink or at the RM conventions. To put up with Dutch proves what a good woman she was! I’m just kidding – we had so many good times & laughs with these two. What fun they were. We still reminisce about times we’ve spent together. although she is now gone I know you are comforted to know they are together again. Rest in Peace Marion. Dear Carol & Malcolm – I know you had prepared but it is still hard to say goodbye. Please know we wish you & the family comfort & peace. Sorry to hear the news about your Mom, thinking of you all. They were such good friends to Mom and Dad.I was just thinking about you all a few weeks ago. May you have solace knowing that she lived a full live and had a wonderful loving family that cared for her always. Sorry to hear about your Mom wow she just celebrated her 100th birthday. Thinking of you. Condolences to you & your family. Our deepest sympathy on the loss of your Mom, Gramma and Great Gramma. Marion was a lovely lady and such a good Mom and Gramma. Brian and I always enjoyed running into Dutch and Marion in Carlyle. They were a charming couple and nobody enjoyed a good joke more than Dutch! I suspect Marion did as well, she was just more reserved than Dutch! Your mother and dad’s lives added much pleasure, and always a friendly greeting to all who knew them. The news of your Mother’s passing brought back many memories of years past. Dutch and Marion were an asset to our community and were good neighbors. People enjoyed your parents all their lives; they were as friendly the last time I saw either one as when I remember them when I was a kid. So glad I knew these special people and I know my folks, Jim and Frances Simons treasured time with both of them. Thinking of you all as your memories bring you solace. My sympathy to on the passing of Marion , I cared for Marion at Coteau in Arcola amazing to have reached 100 I enjoyed getting to know her when I worked there . I am so sorry to hear of the passing of your mother. She was a wonderful lady and I always enjoyed our conversations, she had such a direct, no nonsense approach to life.